What may have been the initial function of glycosomes? Kinetoplastida are protozoan organisms that probably diverged early in evolution from other eukaryotes. They are characterized by a number of unique features with respect to their energy and carbohydrate metabolism. These organisms possess peculiar peroxisomes, called glycosomes, which play a central role in this metabolism; the organelles harbour enzymes of several catabolic and anabolic routes, including major parts of the glycolytic and pentosephosphate pathways. The kinetoplastid mitochondrion is also unusual with regard to both its structural and functional properties. In this review, we describe the unique compartmentation of metabolism in Kinetoplastida and the metabolic properties resulting from this compartmentation. We discuss the evidence for our recently proposed hypothesis that a common ancestor of Kinetoplastida and Euglenida acquired a photosynthetic alga as an endosymbiont, contrary to the earlier notion that this event occurred at a later stage of evolution, in the Euglenida lineage alone. The endosymbiont was subsequently lost from the kinetoplastid lineage but, during that process, some of its pathways of energy and carbohydrate metabolism were sequestered in the kinetoplastid peroxisomes, which consequently became glycosomes. The evolution of the kinetoplastid glycosomes and the possible selective advantages of these organelles for Kinetoplastida are discussed. We propose that the possession of glycosomes provided metabolic flexibility that has been important for the organisms to adapt easily to changing environmental conditions. It is likely that metabolic flexibility has been an important selective advantage for many kinetoplastid species during their evolution into the highly successful parasites today found in many divergent taxonomic groups. Also addressed is the evolution of the kinetoplastid mitochondrion, from a supposedly pluripotent organelle, attributed to a single endosymbiotic event that resulted in all mitochondria and hydrogenosomes of extant eukaryotes. Furthermore, indications are presented that Kinetoplastida may have acquired other enzymes of energy and carbohydrate metabolism by various lateral gene transfer events different from those that involved the algal- and α-proteobacterial-like endosymbionts responsible for the respective formation of the glycosomes and mitochondria. On the basis of comparative cytology and morphology, the Kinetoplastida are placed, together with the Euglenida, into a well-circumscribed group, the Euglenozoa. This group of protists – usually assigned the rank of a phylum – probably diverged early in evolution from the other eukaryotic lineages. It is one of the several major lineages that separated from each other in the early, as yet unresolved, diversification of eukaryotes [1, 2]. The Kinetoplastida are characterized by a number of peculiarities such as the presence of the kinetoplast, a special part of the single mitochondrion where DNA with a highly unusual structure is found; an unusual, often highly complex form of editing of the mitochondrial RNA; the transcription of nuclear genes as very long multicistronic RNA molecules which are then processed to mRNAs by trans-splicing; the apparent absence of specific RNA polymerase II promoters; and a unique way of metabolic compartmentation [3, 4]. The most peculiar aspect in the kinetoplastids' metabolic compartmentation is the sequestering of part of the glycolytic pathway and some other enzyme systems within organelles called glycosomes [5–8]. In recent years, many new data have been collected about trypanosomatid metabolism. Moreover, phylogenetic studies have revealed the relationships between different Kinetoplastida and between these protists and other organisms, and have traced the evolutionary paths of the different lineages. Based on the information from all these studies we will attempt to reconstruct the evolution of kinetoplastid metabolism. However, such attempts are complicated by the facts that (1) there is still no consensus opinion with regard to various aspects of the evolutionary relationships; (2) by far the most information about metabolism has been obtained for Trypanosoma brucei; other kinetoplastids (Leishmania spp, Trypanosoma cruzi, Phytomonas, Trypanoplasma) have been studied in less detail and for many genera no or hardly any information is available as yet; (3) many Kinetoplastida, including all Trypanosomatidae studied to date, are parasites which, in many cases, must have evolved under a strong selection pressure to adapt to their specific host(s); this may have led to the acquisition of new metabolic traits and loss of others, so that important evolutionary information may have been masked; (4) the evolution of the kinetoplastid lineage covered probably a very long time span. This review will primarily discuss the evolution of the energy metabolism which takes place in different subcellular compartments in trypanosomatids, i.e. glycosomes, the mitochondrion and the cytosol. For the sake of clarity, the metabolism and evolution of the organelles will be treated here separately. However, it should be realized that the different organelles – although they have separate, independent origins- and the different branches of metabolism present in the various compartments co-evolved to become a highly integrated metabolic network. Initially, taxonomy and inference of evolutionary relationships of Kinetoplastida were based on morphology and the organisms' life cycles . However, during the last few decades many attempts have been made to reconstruct the evolution of Kinetoplastida by phylogenetic analyses based on macromolecular data. Most often, such analyses were based on small-subunit RNA (ssRNA) genes, but a variety of housekeeping proteins were also used (heat-shock proteins, tubulin, elongation factor 1α, glycolytic enzymes) [e.g. [10–16]]. The relationships between the major taxa have been well established, although there is still some discussion about several aspects. Based on ssRNA analyses it was shown by several authors that various genera (Crithidia, Herpetomonas, Leptomonas, Blastocrithidia), created on the basis of classically used criteria, are actually polyphyletic [e.g. ]. Also based on an 18S ssRNA analysis, paraphyly was claimed for the genus Trypanosoma too; the clusters of the Salivaria (T. brucei) and Stercoraria (T. cruzi) were separated by other genera [, and see other references in ]. However, such a conclusion is not supported by the results obtained by most other phylogenetic analyses, including all trees based on amino-acid sequences, and is also in conflict with the observed conservation of specific functional motifs in proteins. The paraphyletic tree topology obtained for Trypanosoma with ssRNA sequences is possibly an artefact caused by a high rate of substitutions in T. brucei and outgroup lineages . A largely consensus tree that will suit the purpose of this review is given in Fig. 1A. Moreover, this figure also presents the hosts/environments in which the representatives of the different lineages live. The Kinetoplastida are subdivided into two groups: Bodonina and Trypanosomatina. Organisms of the first group are characterized by the presence of two flagella and a relatively large kinetoplast. The group contains both free-living organisms and parasites of fish and snails. The Trypanosomatina have only a single flagellum and a smaller kinetoplast than the Bodonina. The Trypanosomatina comprises a single family, the Trypanosomatidae, of which all members studied so far are parasites of invertebrates (insects, leeches), all classes of vertebrates or plants. The outgroup of the tree presented in Fig. 1A is Euglena gracilis (Euglenida). Various Euglena species can live as facultative phototrophs. These organisms contain a chloroplast which, on the basis of its three surrounding membranes and the analysis of its DNA, pigments and some imported proteins, is supposed to be the remnant of an endosymbiotic green alga (the chloroplast is a 'secondary endosymbiont'). In contrast to the Kinetoplastida, Euglena has peroxisomes  but no glycosomes  and its mitochondria do not contain a kinetoplast DNA network. A. Neighbor-joining tree based on GAPDH nucleic-acid sequences. The horizontal bar represents five substitutions per 100 nucleotides. Numbers at the nodes are bootstrap values (1000 samplings). Accession numbers of sequences used in the analysis: AF322391, Blastocrithidia gerricola; AF047493, Crithidia fasciculata; AF053739, Crithidia fasciculata 2; AF053740, Crithidia luciliae; L39772, Euglena gracilis; AF047494, Herpetomonas samuelpessoai; AF047497, Leishmania major; X65226, Leishmania mexicana; AF053741, Leptomonas lactosovorans; AF322390, Leptomonas peterhoffi; AY029072, Leptomonas pyrrhocoris; AF047495, Leptomonas seymouri; AF320820, Leptomonas sp. Cfm; AF339451, Leptomonas sp. Nfm; AF375664, Leptomonas sp. F2; AF047496, Phytomonas sp. ; AF047499, Trypanosoma brucei gambiense; AF047498, Trypanosoma congolense; X52898, Trypanosoma cruzi; AF053743, Trypanosoma evansi; AF047500, Trypanosoma vivax; AF053742, Trypanosoma rangeli; AF053744, Trypanosoma vivax; AF316620, Wallaceina brevicula; X74535, Trypanoplasma borreli. B. Phylogenetic tree of eukaryotic aldolases. The tree was created using both neighbor-joining and maximum likelihood methods, with and without gamma correction for unequal rates of evolution of sites. 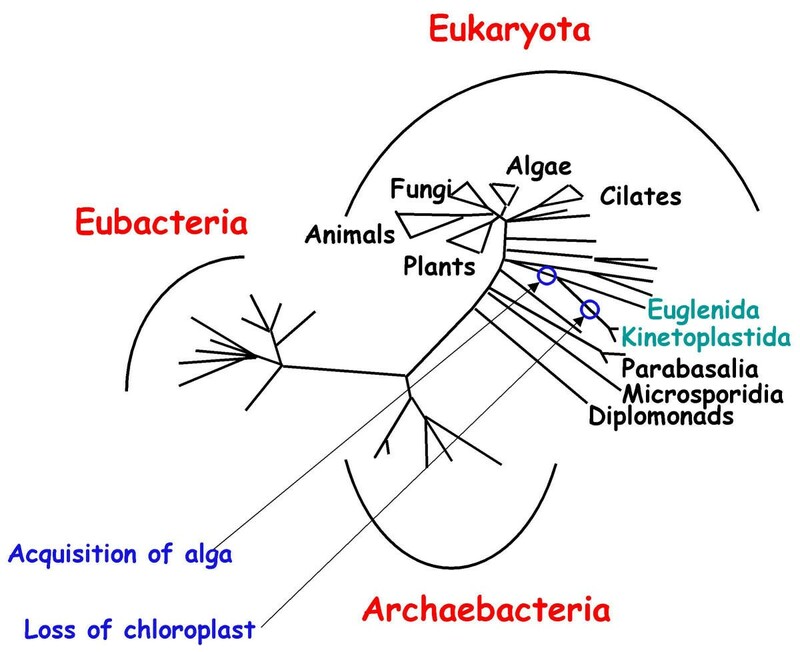 Neigbor-joining analysis was able to divide the sequences into three major clades: chloroplast sequences, plant cytosolic sequences and aldolases of the remainder of the eukaryotes. The trypanosomatids clustered witht the chloroplasts sequences, while the chloroplast sequence from Euglena and those of Plasmodium grouped with the other non-plant aldolases. However, there was no bootstrap support for any of the deep-branching groups. Maximum likelihood analyses grouped all plant sequences (chloroplast and cytosol) as well as the sequences from Euglena, Plasmodium and the Trypanosomatidae together in a single star-like subtree. We recently presented molecular evidence that Trypanosoma and Leishmania contain a considerable number of proteins that are more similar to homologues found in the cytosol or chloroplasts of plants and algae, than to the corresponding proteins from other lower eukaryotes . As an example the phylogenetic tree for the glycolytic enzyme aldolase is shown in Fig. 1B. Moreover, some proteins found in trypanosomes are otherwise specific for plants, such as sedoheptulose-1,7-bisphosphatase. A number of other plant-like traits have been reported before in other publications [e.g. [23–25]]. All these data are summarized in Table I. We have interpreted these data as suggesting that the acquisition of an algal endosymbiont did not occur in the euglenid lineage as assumed so far (reviewed in [26, 27]), but already at an earlier stage, by a common ancestor of the Euglenida and the Kinetoplastida . Only the chloroplast of the endosymbiont was retained by the Euglenida, whereas the Kinetoplastida lost the endosymbiont altogether, except for a considerable number of its genes. The details of this evolutionary process, and its metabolic implications will be discussed below. As mentioned in the Introduction, Kinetoplastida are characterized by the presence of several metabolic peculiarities. The presence of shared features within all members of this order strongly suggests that these must have been present in the common ancestor of all these organisms. Because of their relevance for our evolutionary analysis, we will discuss here in more detail the various shared features and the variations found for each of them in the present-day kinetoplastids. In all Kinetoplastida studied, the major part of the glycolytic pathway is found in organelles called glycosomes (reviewed in [6–8]). These organelles are authentic peroxisomes as may be inferred by different criteria: (1) glycosomes, like other members of the peroxisome family (peroxisomes, yeast microbodies and plant glyoxysomes) are bounded by a single phospholipid bilayer membrane, have an electron-dense proteinaceous matrix and do not contain any detectable DNA; (2) although glycolytic enzymes are the most prominent proteins in glycosomes (they may comprise up to 90% of the content in bloodstream-form T. brucei), some other enzymes or enzyme systems may be present and are shared with peroxisomes: e.g. enzymes of peroxide metabolism, fatty acid oxidation and ether-lipid biosynthesis; (3) glycosomes and other members of the peroxisome family have a homologous process of biogenesis [7, 28]. The matrix proteins are synthesized in the cytosol, with similar peroxisome-targeting signals and are imported by a similar mechanism, involving a cascade of several proteins (called peroxins – acronym 'PEX') which are homologous in the different organelles. 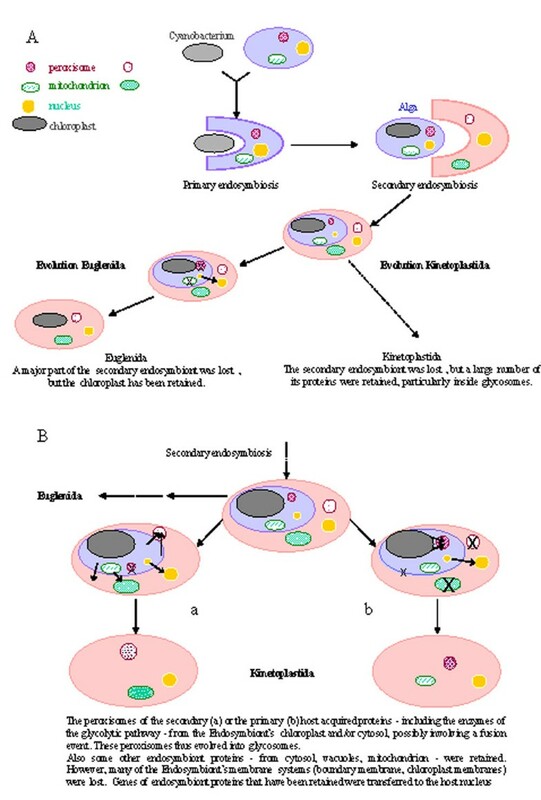 It may be concluded, therefore, that the common ancestor of Kinetoplastida and other eukaryotes already contained peroxisomes and that an ancestral organism in the kinetoplastid lineage additionally acquired the capability to compartmentalize the major part of the glycolytic pathway in these organelles (or alternatively, this ability existed in the ancestral peroxisomes but was lost in all organisms except Kinetoplastida). How this may have happened will be discussed below. Although the presence of glycolysis in peroxisomes is unique, it should be appreciated that the enzymic content of these and related organelles may differ considerably between different organisms. Indeed, the astounding metabolic diversity of the members of the peroxisome family has been already identified many years ago and reviewed by de Duve  and Borst [30, 31]. The glycosomes constitute separate compartments surrounded by membranes that, according to accumulating evidence, are poorly permeable for most metabolites including adenine nucleotides and NAD(H) (reviewed in ). For movement of metabolites across the membrane specific transporter molecules are invoked. Indeed, recent work provides strong indications for the existence of such transporters e.g. homologues of ABC transporters involved in fatty-acid transport across peroxisomal membranes of yeasts and mammalian cells  (C. Yernaux and PM, unpublished). The notion of a closed compartment implies that stoichiometric relationships should be found between the substrates and products of all processes that occur simultaneously inside the organelle. Indeed, glycosomes sequester enzymes in such a way that no net changes in ATP/ADP ratio or in NAD+/NADH ratio seem to occur during the activity of the metabolic processes in the organelle [6, 8]. For example, in bloodstream-form T. brucei, where glycolysis is virtually the only process occurring in the glycosomes, the enzymes converting glucose into 3-phosphoglycerate are all inside the organelle, whereas the last three enzymes are present in the cytosol (Fig. 2A). As a consequence, the intraglycosomal consumption of ATP by hexokinase (HXK) and phosphofructokinase (PFK) is balanced by the ATP production by phosphoglycerate kinase (PGK). Net ATP production occurs in the cytosol, in the reaction catalyzed by pyruvate kinase (PYK). The energy metabolism of bloodstream-form (a) and procyclic T. brucei (b). Enzymes: 1, hexokinase; 2, glucose-6-phosphate isomerase; 3, phosphofructokinase; 4, aldolase; 5, triosephosphate isomerase; 6, glyceraldehyde-3-phosphate dehydrogenase; 7, phosphoglycerate kinase; 8, glycerol-3-phosphate dehydrogenase; 9, glycerol kinase; 10, phosphoglycerate mutase; 11, enolase; 12, pyruvate kinase; 13, glycerol-3-phosphate oxidase; 14, phosphoenolpyruvate carboxykinase; 15, L-malate dehydrogenase; 16, fumarase; 17, fumarate reductase; 18, pyruvate phosphate dikinase; 19, pyruvate dehydrogenase complex; 20, acetate:succinate CoA transferase; 21, proline oxidase; 22, Δ'-pyrroline-5-carboxylate reductase; 23, glutamate semialdehyde dehydrogenase; 24, glutamate dehydrogenase; 25, α-ketoglutarate dehydrogenase; 26, succinyl CoA synthetase; 27, FAD-dependent glycerol-3-phosphate dehydrogenase. Abbreviations: AA, amino acid; AcCoA, acetyl-CoA; 1,3-BPGA, 1,3-bisphosphoglycerate; c, cytochrome c; Citr, citrate; DHAP, dihydroxyacetone phosphate; Fum, fumarate; G-3-P, glyceraldehyde 3-phosphate; Glu, glutamate; Gly-3-P, glycerol 3-phosphate; KG, α-ketoglutarate; Mal, malate; OA, 2-oxoacid; Oxac, oxaloacetate; PEP, phosphoenolpyruvate; 3-PGA, 3-phosphoglycerate; Succ, succinate; Succ-CoA, succinyl-CoA; UQ, ubiquinone. Substrates and secreted end-products are indicated in green and red, respectively, and boxed. Enzymes involved in reactions represented by dashed lines are present, but experiments indicated that no significant fluxes occurred through these steps [62, 95]. A complex II is depicted because succinate dehydrogenase activity and succinate-dependent repiration have been demonstrated in mitochondria of T. brucei procyclics and T. cruzi epimastigotes [167, 168]. However the role of succinate respiration in the overall metabolism of these cells remains to be clarified. No evidence has been reported that electron transfer through complex I of the respiratory chain of trypanosomatids is coupled to proton expulsion. The mitochondrion contains two membranes; the inner membrane containing the respiratory chain and H+-ATPase has been drawn in this figure. Similarly, the NADH resulting from the reaction catalyzed by glyceraldehyde-3-phosphate dehydrogenase (GAPDH) is re-oxidized inside the organelle followed by the transfer of the electrons to a mitochondrial glycerol-3-phosphate oxidase (GPO). This process occurs via a redox shuttle comprising a glycosomal NAD+-dependent glycerol-3-phosphate dehydrogenase (GPDH), a putative transporter in the glycosomal membrane which exchanges glycerol 3-phosphate for dihydroxyacetone phosphate, and the mitochondrial GPO. The transporter remains to be identified, but its existence is inferred from the low permeability of the glycosomal membrane and the requirement for strict coupling of the fluxes by which the two triosephosphates are exchanged [5, 33]. The GPO complex contains a FAD-linked GPDH that is most likely associated with the outer surface of the mitochondrial inner membrane, ubiquinone and a terminal oxidase, known as the alternative oxidase (AOX), that is insensitive to cyanide, but can be inhibited by salicylhydroxamic acid. The redox process catalyzed by the GPO is nonprotonmotive, and thus not coupled to ATP formation. Procyclic, insect-stage T. brucei, and several other trypanosomatids (e.g. different life-cycle stages of Leishmania spp and T. cruzi) have a more elaborate energy- and carbohydrate metabolic network that also involves the mitochondrial Krebs' cycle enzymes and a respiratory chain with coupled transmembrane proton-translocating activity [34, 35]. In these cells, two other ATP-dependent kinases (phosphoenolpyruvate carboxykinase and pyruvate phosphate dikinase [PPDK]) are found in the glycosome, whereas PGK is relocated to the cytosol, with the consequence that the ATP/ADP balance is maintained (Fig. 2B). Similarly, the presence of a glycosomal NAD+-dependent malate dehydrogenase (MDH) and NADH-dependent fumarate reductase (FRD) in these cells (see below) is accompanied by a significant drop in the activity of GPDH, so that the NAD+/NADH balance is maintained. Although this aspect of enzyme distribution and stoichiometric relationship of metabolites and balances for ATP/ADP and NAD+/NADH has not been studied in detail in many Kinetoplastida, the available evidence suggests that the situation is similar throughout the order. This suggests either a similar evolution, in this respect, in all these organisms or, more likely, that the glycosome did not serve for net production of ATP (and NADH) in the common ancestor of the group. It should be noted that a stoichiometric description of glycosomal metabolism in procyclic trypanosomes has not only to be based on the quantitative distribution of fluxes through the various branches of carbohydrate catabolism, but also on other reactions which occur simultaneously inside the organelle, or transport of metabolites across its membrane, and which, for the sake of simplicity, are not presented in Fig. 1B. For example, the glycosomal anabolic processes providing PPi have not been presented. For metabolic schemes comprising most of these other glycosomal processes in procyclic T. brucei, see . The fact that PGK's localization is either glycosomal or cytosolic – or both, as observed in promastigotes of different Leishmania species, T. cruzi epimastigotes and T. borreli [36–39] – as required to maintain the glycosomal ATP/ADP balance, offers a rationale for finding phosphoglycerate mutase and enolase always in the cytosol [5, 40–42]. Although the localization of these enzymes is not directly relevant for the ATP/ADP and NAD+/NADH balances, it would not provide any selective advantage to have them inside the glycosomes with a variable compartmentation of PGK and a constitutive expression of PYK in the cytosol. Initially, it was proposed that the confinement of glycolytic enzymes inside an organelle was an evolutionary adaptation of trypanosomatids to sustain a high glycolytic flux . All glycosomes together constitute about 4% of the total cellular volume of T. brucei, and the enzymes are present at a relatively high concentration. It was therefore assumed that the sequestering of enzymes overcomes a diffusion limitation of glycolytic metabolites and thus enables a high flux. However, this notion is now considered unlikely. First, a relatively high glycolytic flux is only found for some trypanosomatids that live in sugar-rich environments (bloodstream-form T. brucei and Phytomonas living in plant saps and fruits), not in most other members or life-cycle stages. There is no reason to assume that the capacity for a high glycolytic flux must have been a selective advantage for the ancestral kinetoplastids [43, 44]. Second, it was shown that yeast can have a two-fold higher flux than T. brucei, with a less than two-fold higher glycolytic protein content that is not compartmentalized . Third, calculations have shown that, even if the enzymes were dispersed over the entire cytosol, the glycolytic flux of bloodstream-form T. brucei would not be limited by diffusion of metabolites from one enzyme to the next, but rather by the catalytic activity of the enzymes . Another intriguing aspect of glycosomes is the apparent lack of activity regulation of the glycolytic enzymes HXK (shown for T. brucei and T. cruzi) and PFK (shown for T. brucei and L. donovani) [46–49]. In most organisms, the activities of these two key enzymes, as well as that of PYK, are highly regulated, by their products, by metabolites further downstream in the metabolism or by other (allosteric) effectors. This regulation serves two purposes. First, it prevents the loss of ATP by futile cycling when glycolysis and gluconeogenesis occur simultaneously. Second, it has been argued, and experimentally confirmed by using yeast mutants, that the design of glycolysis is intrinsically dangerous by the fact that ATP is first invested before net production takes place ("turbo design") . This investment of ATP makes the reactions catalysed by the first enzymes virtually irreversible and thereby insensitive to enzyme activity further down the pathway (Fig. 3A). This may lead to unrestricted accumulation of glycolytic intermediates unless the activity of the first steps of the pathway (i.e. HXK and PFK) is tightly regulated to prevent this. Implications of the "turbo" design of the glycolytic pathway. (A) The design of the glycolytic pathway, with its first steps (HXK, PFK) kept far from equilibrium by continuous investment of ATP, may lead to unrestricted accumulation of intermediates, if no tight regulation of these steps occurs by product or feed-back inhibition. (B) The compartmentation of the major part of the pathway in trypanosomes (resulting in no net ATP production inside the glycosome), may lead to a low ATP/ADP ratio sensed by HXK and PFK (and different from the ratio in the cytosol), thus keeping the activities of these enzymes under control without need for feed-back inhibition. Abbreviations: I, metabolic intermediate; S, substrate; P, product. The question then arises of why the activities of the glycosomal HXK and PFK are not regulated in trypanosomatids, whereas their cytosolic PYK is highly regulated. A clue has been obtained by computer studies. A mathematical model of glycolysis in bloodstream-form T. brucei was constructed and used to assess the metabolic consequences of compartmentation [45, 51]. One of the questions addressed was how the functional behaviour of trypanosome glycolysis would change if the pathway were not compartmentalized. According to the computer model this would not significantly affect the steady-state glycolytic flux, in agreement with the conclusions described above. But strikingly, it would lead to toxic accumulation of hexose phosphates upon addition of glucose. Such toxic accumulation was prevented by compartmentation, since the kinases in the beginning of the pathway then respond to the lower glycosomal ATP/ADP rather than to the higher cytosolic ATP/ADP ratio (Fig. 3B). This prediction made by the computer model may be experimentally testable by using recently developed T. brucei cell lines in which glycosomal protein import can be impaired by depletion of peroxin mRNAs through RNA interference (RNAi) [52, 53]. Upon induction of PEX14 mRNA degradation, bloodstream-form cells, which are entirely dependent on glycolysis, were readily killed. In accordance with the model, glucose also appeared to be toxic for the corresponding procyclic trypanosomes, but these cells survived when grown on non-sugar substrates. Therefore, we may conclude that the compartmentation of glycolysis serves a regulatory function that compensates for the lack of activity regulation of its enzymes. One may wonder if this regulatory function played a role in establishing the glycosome in the ancestral kinetoplastids. We prefer the notion that the apparent absence of activity regulation is a derived character, for the following reasons. (1) Enzymes such as HXK and PFK are regulated in virtually all organisms ; some activity regulation mechanisms are shared between the enzymes of pro- and eukaryotes and must, therefore, also have been present in the enzymes of ancestral kinetoplastids. (2) Because of the compartmentation and the low permeability of the glycosomal membrane for many metabolites, some regulatory mechanisms may have become redundant (due to loss of selective pressure to maintain them) or cannot work (since the effectors are produced outside the glycosome); the kinetoplastids could afford to lose them. Interestingly, the compartmentation seems to have resulted in a kind of 're-routing' of regulatory mechanisms. In most eukaryotes, fructose 2,6-bisphosphate allosterically activates PFK and inhibits fructose-1,6-bisphosphatase (F1, 6BPase) that catalyses the reverse reaction in gluconeogenesis. Fructose 2,6-bisphosphate is the most potent physiological regulator of glycolysis known . This is also true in kinetoplastids, where however it has no effect on PFK, but activates the cytosolic PYK [56–59]. In contrast, in the related Euglena -as in plants- a (pyrophosphate-dependent) cytosolic PFK is activated and the F1, 6BPase inhibited by fructose 2,6-bisphosphate. The domains of PFK and PYK that have, in non-kinetoplastids and kinetoplastids respectively, a high-affinity binding site for the allosteric effector fructose 2,6-bisphosphate are not homologous; the presence of the effector site in the different enzymes represents a clear example of convergent functional evolution. Although the regulated enzymes are different in Kinetoplastida and other eukaryotes, the mechanisms responsible are homologous. In kinetoplastids, fructose 2,6-bisphosphate is synthesized and hydrolyzed in the cytosol  by 6-phosphofructose-2-kinase and fructose-2,6-bisphosphatase, respectively, which are distant from, but yet evolutionarily related to 6-phosphofructose-2-kinase and fructose-2,6-bisphosphatase of other eukaryotes (N. Chevalier and PM, unpublished). Furthermore, the binding site for fructose 2,6-bisphosphate in trypanosomatid PYKs corresponds to the effector site for fructose 1,6-bisphosphate found in PYKs of other eukaryotes and must have evolved from such a site in a common ancestral PYK [60, 61]. These observations suggest that the common ancestor of Kinetoplastida and other eukaryotes possibly had similar regulation mechanisms for glycolysis, but that the situation has changed when glycolysis became compartmentalized in the former lineage. The apparent absence of activity regulation of key glycolytic enzymes such as PFK nevertheless remains remarkable, however, because a F1, 6BPase was recently detected in T. brucei . The enzyme appeared to contain a peroxisome-targeting signal (PTS) and was indeed located inside glycosomes of both bloodstream-form and procyclic trypanosomes, simultaneously expressed with PFK (VH, unpublished). However, so far no F1, 6BPase activity could be detected in bloodstream-form and procyclic cells cultured with glucose, although the enzyme was shown to be active when expressed heterologously in E. coli. This suggests the existence of an as yet unidentified mechanism of activity regulation to prevent futile cycling by these enzymes. The finding of PFK and F1, 6BPase within a single compartment also invalidates the hypothesis, which we proposed previously , that the glycosome has a role for spatial separation of fluxes through different pathways such as glycolysis and gluconeogenesis, as an alternative device for activity regulation of key enzymes to prevent unwanted interference. As mentioned above, in procyclic T. brucei and in the different life-cycle stages of most other trypanosomatids, all or most glycosomal NADH produced in the GAPDH reaction is not reduced via the GPDH/GPO shuttle, but by other redox enzymes expressed in the glycosomes, MDH and FRD. This is achieved in the following way (see Fig. 2B) [6, 35, 62]. Instead of a glycosomal PGK as in bloodstream-form T. brucei, a cytosolic PGK is expressed. The 1,3-bisphosphoglycerate produced by GAPDH leaves the glycosomes, has its 1-phospho group transferred to ADP by PGK to form ATP, and is further metabolized to PEP. Part of this PEP re-enters the glycosome, another part may be converted in the cytosol to pyruvate to be directed to mitochondrial metabolism or used for alanine production. The glycosomal PEP may follow two routes. Either it is converted to pyruvate by the glycosomal enzyme pyruvate phosphate dikinase (PPDK) , with the concomitant production of ATP from AMP and PPi, or to oxaloacetate by the catalytic action of phosphoenolpyruvate carboxykinase, also leading to ATP production. These two glycosomal kinases (PPDK and phosphoenolpyruvate carboxykinase) compensate for the replacement of the glycosomal PGK by a cytosolic isoenzyme, and guarantee that the glycosomal ATP/ADP balance is maintained. The oxaloacetate is further converted inside the glycosomes to succinate, an important metabolic end product, by the catalytic action of three glycosomal matrix enzymes, MDH, fumarase and FRD . What could be the evolutionary rationale for this glycosomal succinate production? A clue may be found in the presence of the soluble NADH-dependent glycosomal FRD . Most FRDs characterized so far in prokaryotes and eukaryotes are associated with oligomeric membrane-protein complexes, use quinols as electron donors, participate in electron-transfer chains and are expressed under anaerobic conditions . Only very few organisms are known to express a soluble FRD that is not associated with membrane complexes : in the bacterium Shewanella sp. the enzyme is expressed under anaerobiosis, accepts electrons from quinols and is part of an electron-transfer chain . In Saccharomyces cerevisae two soluble FRD forms are expressed under anaerobiosis and use FADH2/FMNH2 as electron donors . The T. brucei procyclic form (probably all trypanosomatids, except the T. brucei bloodstream form) expresses the glycosomal NADH-dependent FRD under aerobiosis (and probably also isoenzymes in other compartments ). In 1980, a theory was developed regarding the evolution of biological energy-transducing systems, with a key role for FRD . The theory states that in primitive anaerobic organisms, lactic fermentation of hexoses (glycolysis) (Fig. 4A) evolved to "succinic fermentation" by replacing a NADH-dependent reductase (lactate dehydrogenase) by a pathway of four steps containing a CO2-fixation enzyme (phosphoenolpyruvate carboxykinase or pyruvate carboxylase), fumarase and two NADH-dependent reductases (MDH and a soluble NADH-dependent FRD) (Fig. 4B). This evolutionary step would offer the significant advantage of requiring 50% less pyruvate (or PEP) to maintain the NAD+/NADH balance and consequently of sparing the remainder of this tricarbon compound for biosynthetic processes. Subsequently, the rate of energy production could be considerably improved by integrating FRD into an electron transfer chain, as observed for most of the present day anaerobic organisms using fumarate as the final electron acceptor . Finally, with the appearance of aerobic conditions, the membrane-bound FRD evolved to a membrane-bound succinate dehydrogenase. Comparison of glycolysis in primitive anaerobic organisms and trypanosomatids. The consumption of one glucose molecule through glycolysis generates two molecules of pyruvate, ATP and NADH. To maintain the redox balance (NAD+/NADH ratio) of the cell, NADH produced by GAPDH has to be oxidized to NAD+. In the simplest fermentation scheme, the lactic fermentation (panel A), which probably occurred in the primitive anaerobic organisms, NAD+ is stochiometrically regenerated by converting pyruvate into lactate by lactate dehydrogenase . A variation of this primitive scheme, the "succinic fermentation" (Panel B), is the replacement of the reduction step (lactate dehydrogenase) by one carboxylation step (pyruvate carboxylase) followed by two reduction steps (MDH and FRD). 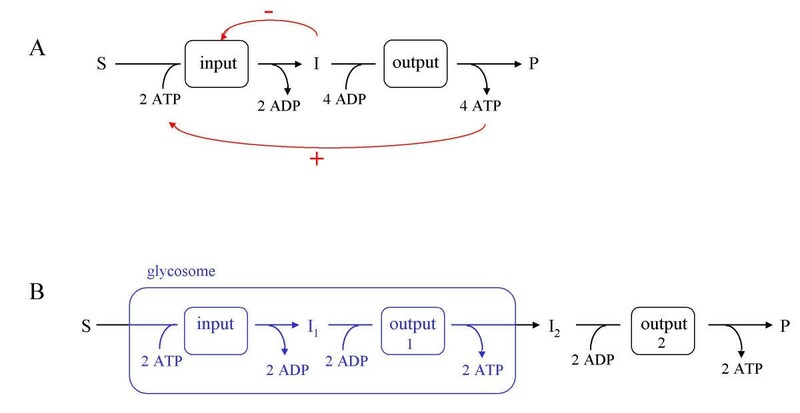 The consequence of this adaptation is that one half of the PEP is converted into succinate to maintain the redox balance, while the other half can be used for biosynthetic pathways. In 1980, Gest  proposed that the primitive FRD was soluble and NADH dependent, whereas none of the known present-day FRDs possess both characteristics. Interestingly, the trypanosome glycosomal FRD is soluble and NADH dependent . Panel C shows the succinate product pathway recently characterized in the procyclic form of T. brucei, which ressembles primitive "succinic fermentation". The NAD+, NADH, ADP and ATP molecules produced by this pathway are bold faced and underlined, with a special attention to NAD+/NADH which are circled. For the boxed glycolytic metabolites (G-3-P, 1, 3BPGA, 3-PGA, PEP and/or pyruvate), two molecules are produced per glucose consumed. End products (lactate, succinate and acetate) are in white characters on a black background. The metabolic flux at each enzymic step, necessary to maintain stoichiometric relationships of all reactions in the cell (panels A and B) or compartment (panel C), is tentatively represented by arrows with different thickness. Abbreviations: 1, 3BPGA, 1,3-bisphosphoglycerate; DHAP, dihydroxyacetone phosphate; FBP, fructose 1,6-bisphosphate; F6P, fructose 6-phosphate; G-3-P, glyceraldehyde 3-phosphate; G6P, glucose 6-phosphate; OAA, oxaloacetate; PEP, phosphoenolpyruvate; 3-PGA, 3-phosphoglycerate. Enzymes are: 1, HXK; 2, glucose-6-phosphate isomerase; 3, PFK; 4, aldolase; 5, triosephosphate isomerase; 6, GAPDH; 7, PGK; 8, phosphoglycerate mutase; 9, enolase; 10, PYK; 11, lactate dehydrogenase; 12, pyruvate carboxylase; 13, MDH; 14, fumarase; 15, NADH-dependent FRD; 16, phosphoenolpyruvate carboxykinase. Interestingly, the glycosomal metabolism in the procyclic form of T. brucei, and probably all trypanosomatids except the bloodstream form of the T. brucei group, resembles the 'succinic fermentation' in anaerobic organisms (Fig 4Cvs Fig. 4B): (1) the trypanosomatids are the only known organisms that express soluble NADH-FRD; (2) glycosomal FRD seems to play a role in the maintenance of the redox balance in the organelle; (3) all key enzymes which lead to succinate production from glucose are located in the same compartment, i.e. the glycosomes; (4) while the procyclic cells are grown under aerobic conditions, the glycosomes can be considered as anaerobic compartments and (5) as proposed for the 'succinic fermentation' in primitive anaerobic organisms, the presence of a glycosomal NADH-FRD in trypanosomes implies that part of the cytosolic PEP can be used for other catabolic or anabolic pathways, either directly or after conversion into pyruvate by the cytosolic pyruvate kinase. The idea that heterotrophy, with glycolysis as the central process, is the most ancient form of metabolism has been seriously questioned by recent evolutionary analyses [e.g. ]. It seems probable that, in prokaryotes, autotrophic metabolism developed first, and that glycolysis evolved later as a reverse process of the gluconeogenic pathway [54, 70]. This scenario renders the hypothesis as proposed by Gest, which implies that glycolysis is an early process in anaerobic prokaryotes, unlikely. Nevertheless, the notion of glycolysis as the pathway of carbon metabolism ancestral to eukaryotes is firmly asserted, and the principle of pathway extension as proposed by Gest may well be the rationale by which trypanosomes evolved their succinate production pathway. Glycolysis is not the only metabolic process occurring in glycosomes. Like in other members of the peroxisome family, enzymes involved in peroxide metabolism can be found in these organelles, although catalase, the hallmark enzyme of peroxisomes, has not been detected in glycosomes of T. brucei and Leishmania species. It is however present in glycosomes of Phytomonas and Crithidia. Other pathways or enzymes shared with peroxisomes are β-oxidation of fatty acids, the first part of the biosynthesis of ether lipids and HMG-CoA reductase for isoprenoid synthesis. Glycosomes contain also enzymes of the pentosephosphate pathway; the presence of the dehydrogenases of this pathway has been reported too for rat liver peroxisomes . Unique for glycosomes is, however, the presence of enzymes involved in purine salvage, pyrimidine biosynthesis and gluconeogenesis [6–8, 72]. The presence of gluconeogenesis in glycosomes was already discussed above. The compartmentation of this pathway can be understood, because most of its enzymes, catalyzing reactions which are reversible under physiological conditions, are shared with glycolysis. However, the existence of a mechanism that prevents uncontrolled simultaneous activity of both processes seems essential. Such a mechanism remains to be identified in kinetoplastids. A discussion of the presence of the pentosephosphate pathway in glycosomes is highly relevant for this review, because the activity of this alternative glucose-breakdown process provides the cell with NADPH for reductive biosyntheses and the defense against oxidative stress and with ribose 5-phosphate to be used in nucleotide synthesis. A cell distributes its glucose breakdown via the glycolytic and the pentosephosphate pathways, depending on the relative needs for ATP, NADPH and ribose 5-phosphate. A variable extent of interplay between these pathways may tune the levels required for ATP, reduced cofactor or metabolites. In bloodstream-form T. brucei cells, the relative flux through the pentosephosphate pathway will be very minor, as inferred from the amount of pyruvate produced from glucose. Even in growing cultured cells the amount of pyruvate observed is close to the maximum possible of two molecules of pyruvate produced per molecule of glucose consumed. The channelling of glucose into the pentosephosphate pathway must therefore be very small. Moreover, the pentosephosphate pathway enzymes have low specific activities compared to those of the glycolytic pathway. However, the specific activities are considerably higher in procyclic T. brucei and in Leishmania promastigotes. 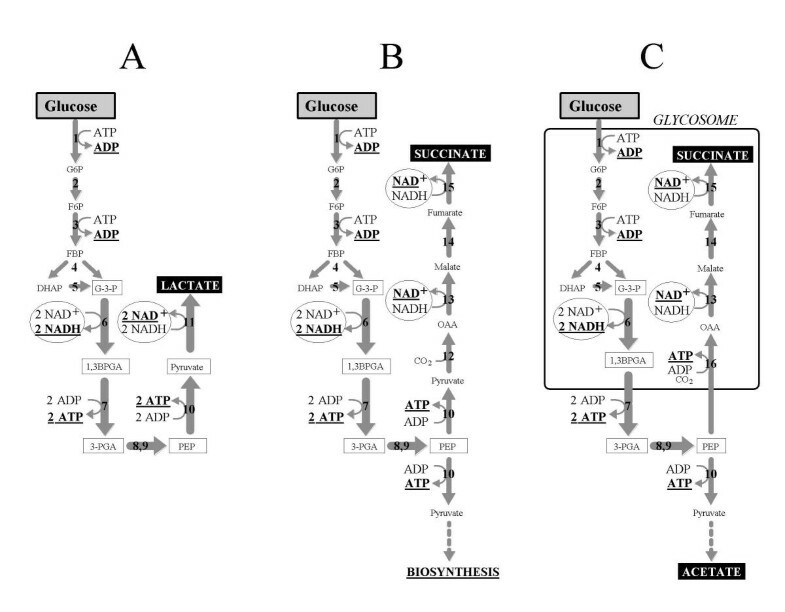 For two enzymes of this pathway studied in T. brucei (glucose-6-phosphate dehydrogenase, 6-phosphogluconolactonase) a dual distribution was found: 15 – 50% of the activity appeared to be associated with glycosomes, the remainder was present in the cytosol [73, 74]. It is expected that this will also be the case for other enzymes in T. brucei and Leishmania, because various other sequences bearing a PTS were identified in the genome databases (e.g. ribulose-5-phosphate epimerase, ribose-5-phosphate isomerase, transketolase). There may be several reasons for having the pathway, or at least a part of it, in both compartments. (1) The glycolytic and pentosephosphate pathways should be able to exchange intermediates to adjust to cellular needs for ATP, reductive power and nucleotide precursors. (2) The end-product ribose 5-phosphate is converted into 5-ribosyl-1-pyrophosphate that will serve in the purine and pyrimidine biosyntheses, processes occurring within the glycosomes. (3) Enzymes involved in the defense against reactive oxygen species (ROS) have been found both in the cytosol and glycosomes [75, 76]. For example, a peroxidase was located in T. cruzi glycosomes that, via glutathione and tryparedoxin, receives its electrons from trypanothione . Moreover, indications have been obtained for the presence of trypanothione reductase not only in the cytosol but also in the glycosomes of T. cruzi and T. brucei. These defense systems are, via trypanothione reductase, ultimately dependent on NADPH produced through the pentosephosphate pathway. Whether the redox reactions involving NADPH/NADP within the glycosome are linked via a shuttle mechanism to redox reactions outside the organelle, or if there is a balance in NADPH formation and consumption by the different glycosomal enzyme systems dependent on this cofactor, remains to be established. So far, no glycosomal transhydrogenase activity has been identified that could be responsible for establishing a redox equilibrium between the organellar NADP(H) and NAD(H) pools. The evolutionary origin of glycosomes has been a matter of interest since the identification of these organelles, over 25 years ago [5, 40, 77]. Our original hypothesis proposed that the glycosome was derived from a bacterial endosymbiont, in a manner similar to mitochondria and chloroplasts, but that it had lost its entire genome . This absence of remnant DNA has complicated the uncovering of the organelle's evolutionary tracks. Initial analyses of glycosomal matrix-protein gene sequences did not provide any convincing indications for the relocation of a prokaryotic endosymbiont's genes for glycolytic enzymes to the nucleus of its eukaryotic host. Subsequently, the endosymbiont theory lost its appeal when studies of the biogenesis of glycosomes, peroxisomes, microbodies and glyoxysomes clearly proved that these organelles must have had a common, monophyletic origin and that protein import into these organelles appeared unrelated to that of any protein translocation mechanism known in prokaryotes [7, 28, 43]. Glycosomes appeared to be true peroxisomes and, therefore, they seemed not to be relics of an endosymbiont. The most likely origin of the ancestral organelle that gave rise to different members of the peroxisome family is, therefore, from within the primitive eukaryote itself. A problem associated with this hypothesis seemed the presence of glycolysis (and major parts of other pathways) uniquely in glycosomes. How did these pathways end up in glycosomes? One possibility, although unlikely and not supported by any data, is that they have always been there; they were only retained in the kinetoplastid glycosomes but lost from all other members of the organelle family. Alternatively, glycolysis was acquired only by peroxisomes of the ancestral Kinetoplastida. A conceptual problem with this latter hypothesis is the fact that transfer of a pathway to an organelle should have occurred "en bloc", because the formation of a functional pathway through a successive transfer of individual enzymes to the organelle should be considered highly unlikely. As argued elsewhere, intermediate stages would not be an advantage to the organisms but, rather, would be a burden [78, 79]. Other questions to be addressed by any hypothesis that does not invoke an endosymbiotic event for the formation of the new organelle is how it should multiply itself and how it could be passed on to the progeny of the ancestral cell that acquired it. In recent years, we have characterized genes for a considerable number of metabolic enzymes of T. brucei and L. mexicana, while through research by others and through genome-sequencing projects corresponding gene sequences have become available for a large number of organisms representative of all major taxa. This has enabled us to re-investigate thoroughly the phylogenetic relationships of trypanosomatid metabolic enzymes. As described above, the surprising finding was made that a considerable number of parasite enzymes are most closely related to enzymes from phototrophic organisms; either enzymes from plants/algae-cytosolic or plastidic- or from cyanobacteria . Moreover, Trypanosomatidae appear to share some other features with plants, such as the presence of the polyunsaturated fatty acids linoleic acid and α-linolenic acid, and the presence of acidocalcisomes, which have properties similar to plant vacuoles (see below). Intriguingly, we detected a sedoheptulose-1,7-bisphosphatase (S1, 7BPase), that is considered to be a hallmark of the Calvin cycle of photosynthetic organisms. Together these data suggest that ancestral Kinetoplastida must have harbored a phototrophic endosymbiont. Most likely, this endosymbiont is the same as the green alga that gave rise to the chloroplast (secondary endosymbiont) in the Euglenida; the phototrophic endosymbiont was acquired by the common ancestor of Kinetoplastida and Euglenida. It was retained as an organelle in many euglenids, but lost in kinetoplastids, while still leaving some traces in the present-day organisms (Fig. 5). Modified tree of life (after ) to show the early acquisition a phototrophic endosymbiont by the Euglenozoa. The endosymbiont's chloroplast was retained in the euglenid lineage, while the entire endosymbiont was lost from the kinetoplastid lineage. Although such plant/algal-like proteins are found in various compartments of the trypanosomatid cell (e.g. the mitochondrial AOX mentioned above is found in all plants and algae, as well as in some fungi and Dictyostelium discoideum too), it is remarkable that a relatively high number of them represent enzymes of the glycolytic and pentosephosphate pathways present in the glycosomes (see Table I). Also several other (putative – as inferred from the presence of a PTS) glycosomal enzymes (superoxide dismutase, adenylate kinase, peroxidases) have plant features and the S1, 7BPase, having a PTS, is most likely also present in the organelle. We hypothesize, therefore, that a major part of the endosymbiont's metabolic machinery and genome was transferred "en bloc" to a peroxisome of the ancestral kinetoplastid, after the divergence of this lineage from the euglenids. This could have occurred by a direct fusion. A critical aspect of this event would be that DNA from the endosymbiont's nucleus or chloroplasts ended up in the hybrid organelle. This would provide the daughter organelles also with the capability of expressing the proteins acquired from the endosymbiont. The division, growing and stable transmission of the organelles to daughter cells continued to occur as for the original peroxisome. In due time, genes were transferred from the organelle to the host nucleus, or were lost, while the new organellar proteins acquired a PTS (Fig. 6). In the long run, all DNA was lost and all new proteins involved in functions of the organelle became encoded in the host's nucleus. Evolution of Kinetoplastida and Euglenida. A. Acquisition of a chloroplast by secondary endosymbiosis. B. Possible evolutionary scenarios how the secondary endosymbiont was lost in the kinetoplastid lineage but left its traces in different cell compartments of extant organisms. Peroxisomes evolved into glycosomes by the acquisition of pathways of carbohydrate metabolism. These latter steps of the process are similar to what has happened during evolution in most eukaryotes to genes now present in the nucleus and coding for mitochondrial and chloroplast enzymes; they are considered relatively minor evolutionary steps. As inferred from phylogenetic analyses, the glycosomal enzymes of the extant trypanosomatids constituting the glycolytic and the pentosephosphate pathways may have originated from the endosymbiont's cytosolic enzymes involved in similar processes, or from those of its chloroplast, where similar reactions are catalyzed by enzymes of the Calvin cycle. The acquisition of a PTS either by enzymes encoded by the genes transferred from the hybrid endosymbiont/peroxisome to the host nucleus, or by the original host genes, resulted in the organelles' present-day mosaic appearance (Table I). 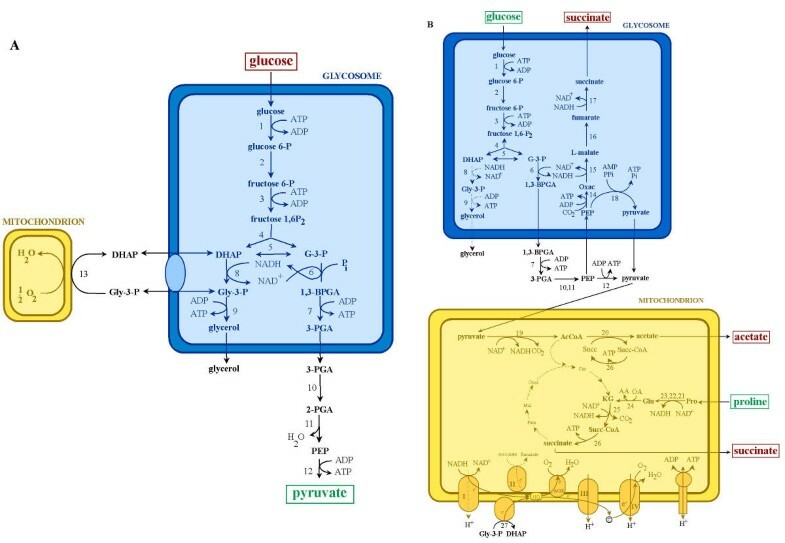 The relocation of a large number of algal enzymes has dramatically changed the metabolic functions of the original peroxisome and has been a crucial step toward the formation of the present-day glycosome with carbohydrate catabolism as its hallmark. An interesting aspect is that one of the glycolytic enzymes from the endosymbiont seems to have ended up in the cytosol: a cofactor 2,3-bisphosphate-independent phosphoglycerate mutase. This enzyme appears not only most similar to its plant counterparts in a phylogenetic analysis [22, 41], but also in the fact that it uses cobalt as catalytic metal ion, rather than manganese that is used by most other cofactor-independent phosphoglycerate mutases [80, 81]. This is remarkable because in general only very few eukaryotic enzymes are cobalt dependent. Moreover, most parasitic kinetoplastids live in habitats where the availability of this metal is extremely low. Nevertheless, these organisms have not changed their metal preference during evolution. The reason why this enzyme was not retained in the organelle, but was relocated to the cytosol, has been discussed above. As mentioned above, S1, 7BPase gene sequences have been detected in trypanosomatids (T. brucei, T. cruzi and L. major). Detailed inspection of the encoded amino-acid sequence showed that it is very likely an active, authentic S1, 7BPase. This finding is surprising, because S1, 7BPases have so far only been found in chloroplasts where the enzyme plays a role in the Calvin cycle. However, the presence of a functional Calvin cycle in kinetoplastids may be excluded; for example, there is no indication from genome databases or biochemical studies for the presence of ribulose-1,5-bisphosphate carboxylase ("rubisco"). Because the Calvin cycle and the pentosephosphate pathway are processes which are similarly organized and share a number of enzymes, we postulate that in trypanosomatids the S1, 7BPase is involved in an unusual kind of pentosephosphate pathway. The substrate for the enzyme, sedoheptulose 1,7-bisphosphate is, in chloroplasts, formed through the action of a bifunctional aldolase. This bifunctional enzyme can perform the regular glycolytic reaction, the condensation of glyceraldehyde 3-phosphate and dihydroxyacetone phosphate to fructose 1,6-bisphosphate, as well as the condensation of glyceraldehyde 3-phosphate and erythrose 4-phosphate to sedoheptulose 1,7-bisphosphate. Glycolytic aldolases can perform only the former (reversible) reaction. 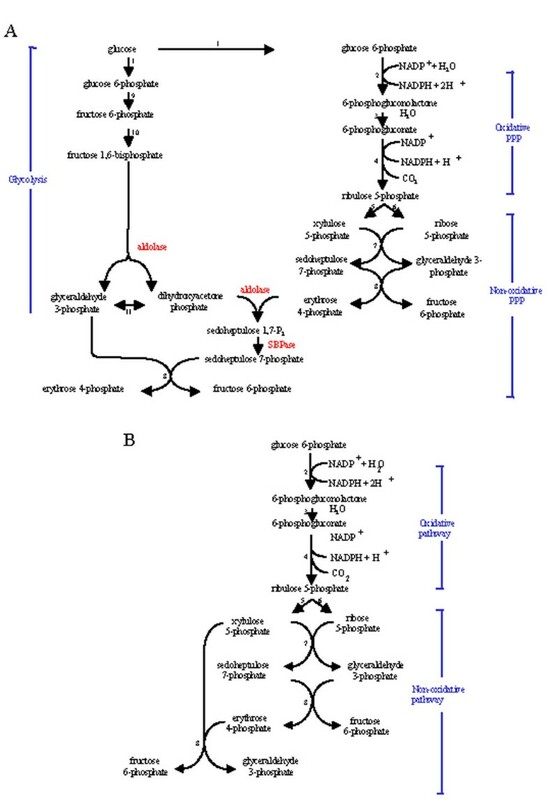 However, in a phylogenetic analysis, the glycosomal aldolases of T. brucei and L. mexicana, which are known to function in glycolysis, appeared to form a robust monophyletic group with the chloroplast aldolases from both plants and algae (Fig. 1B and ), suggesting that they are also capable of forming the bisphosphorylated seven-carbon sugar. This conclusion is reinforced by structural analysis. Plastid and kinetoplastid aldolases share a specific Gly-Ala substitution in the active site. The Ala is not found in any of the non-chloroplast aldolases analyzed. Based on crystal-structure analysis , structure modelling and molecular-dynamics studies (unpublished), it may be concluded that this seemingly minor substitution has major consequences for the active site. In glycolytic aldolases, the presence of an alanine would result in a clash of the phospho group of dihydroxyacetone phosphate with the amino acid's side chain. Therefore, the dihydroxyacetone phosphate cannot be positioned in the kinetoplastid and chloroplast aldolases as it is in the Gly-containing aldolases. It will only fit in the active site if some space is available elsewhere, for example by a different position of the side chain of a conserved Ser residue. Because of the shared active-site structural features, it seems very likely that plastid and kinetoplastid aldolases have a monophyletic origin and may share catalytic properties, i.e. the capability to synthesize sedoheptulose 1,7-bisphosphate. Based on (1) the necessity for an interplay of the glycolytic and pentosephosphate pathways, (2) the possible bifunctional nature of aldolase, and (3) the presence of the S1, 7BPase with its likely (at least in part) localization within glycosomes like many glycolytic and regular pentosephosphate pathway enzymes, we propose a metabolic, stoichiometric scheme shown in Fig. 7A (compared with the classical scheme of the pentosephosphate pathway given in Fig. 7B). The routes depicted in this figure (or similar, equally feasible stoichiometric schemes) allow the trypanosomatids to tune the yield of ATP, NADPH and ribose 5-phosphate, dependent on their needs, by varying the relative fluxes through the two pathways for glucose breakdown, and varying the interplay of these pathways via their nodes of shared metabolites. Pentose-phosphate pathway. A. Scheme of a possible pentosephosphate pathway variant in Trypanosomatidae. B. Scheme of a classical pentosephosphate pathway. It is proposed that the aldolase of Trypanosomatidae shares a bifunctional activity with its homologues from chloroplasts; in addition to its glycolytic/gluconeogenic activity, it may condense dihydroxyacetone phosphate and erythrose 4-phosphate to sedoheptulose 1,7-bisphosphate. Sedoheptulose-1,7-bisphosphatase will then dephosphorylate this product, producing fructose 6-phosphate (for another round through the pentosephosphate pathway after its isomerisation to glucose 6-phosphate by glucose-6-phosphate isomerase – to produce NAPDH, or for glycolysis – to produce ATP) and erythrose 4-phosphate (for further metabolism, e.g. to be converted, together with xylulose 5-phosphate into fructose 6-phosphate and glyceraldehyde 3-phosphate (for further breakdown by glycolysis) by transketolase. Enzymes: 1. hexokinase; 2, glucose-6-phosphate dehydrogenase, 3, 6-phosphogluconate lactonase; 4, 6-phosphogluconate dehydrogenase; 5, ribulose-5-phosphate 3-epimerase; 6, ribose-5-phosphate isomerase; 7, transaldolase; 8, transketolase; 9, glucose-6-phosphate isomerase; 10, phosphofructokinase, 11, triosephosphate isomerase. Above, several functions of the glycosome, or consequences of the specific way of metabolic compartmentation by these organelles in Kinetoplastida, have been discussed. Although several features of this compartmentation seem important for the metabolism of present-day trypanosomes, and for their viability, they may all be derived characters, as a result of a long evolution and the adaptation of different kinetoplastids to highly specific environments. It is difficult to imagine what may have been the selective advantage to the ancestral kinetoplastid for the peroxisome to be modified into a glycosome by the events described above. Nevertheless, recent research on yeast peroxisomes has provided significant insight into the advantage of having important parts of their metabolism compartmentalized into peroxisomes. The outcome of this research seems highly relevant for our search for an overall function of glycosomes that pertains to many Kinetoplastida and may have provided an important selective advantage throughout evolution, both in the initial and later stages. Many Kinetoplastida have a complex life cycle in which they encounter a number of highly different environments and undergo major morphological and metabolic changes [3, 83]. The metabolism of these organisms is characterized by an exceptional degree of flexibility. Through this metabolic flexibility the organisms are able to respond efficiently to large and often sudden nutritional changes. We postulate that the unique compartmentation of metabolism involving glycosomes confers similar adaptability. Recent data obtained by peroxisome research using different yeasts (Hansenula, Pichia, Saccharomyces) have shown that peroxisome biogenesis and degradation are inducible. The turnover of the organelles occurs in a regulated and selective way, dependent on the culturing conditions (Fig. 8). It appears that the compartmentation of key metabolic enzymes in these yeast organelles endows the cells with the capability of adapting in a rapid and efficient manner to new growth substrates. Schematic representation of induced selective degradation and proliferation of peroxisomes, as observed in yeasts [84–86]. New growth conditions requiring peroxisomes with a different enzymic content lead to induction of peroxisome degradation ('pexophagy'); individual, mature peroxisomes are tagged for recognition by phagosomes/vacuoles (step 1), while new, small organelles may serve as mother organelles for peroxisome development under new inducing conditions. The old peroxisomes are sequestered by the vacuoles (steps 2 – 4) and hydrolyzed (steps 5 – 6). Abbreviations: P, peroxisome; V, vacuole. The different colours of the old and new peroxisomes represent the altered enzymic content. The peroxisomal population is heterogeneous. Peroxisomes grow and, at a certain size, multiply by budding and fission. However, after fission, the mature organelles lose their capacity to incorporate additional proteins: import of these molecules is confined to the smaller daughter organelles that have budded off. By incorporating new proteins only into new organelles, the organism can prepare peroxisomes adapted to a new situation: organelles with a different set of enzymes of which the expression is induced by the altered growth conditions. Similarly, the degradation of peroxisomes appears inducible and selective. 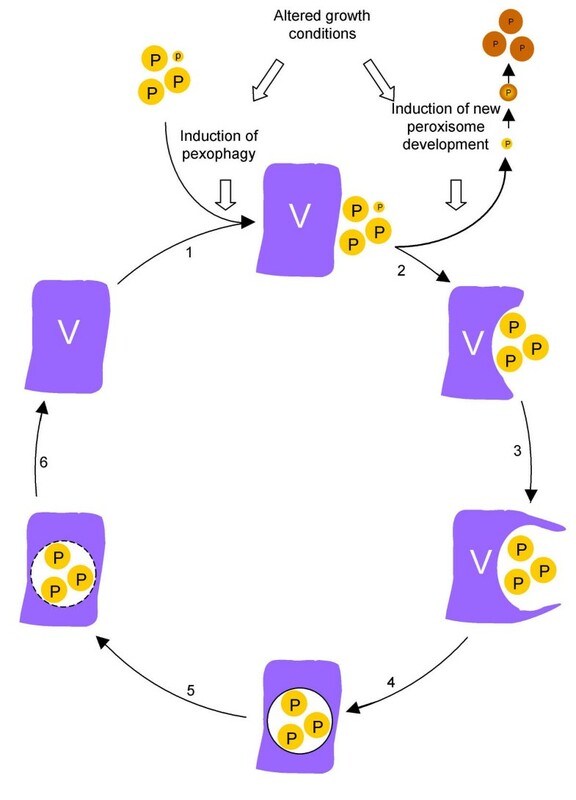 When yeast peroxisomes with specific enzymic content are no longer needed because of a change in environmental conditions, the individual old peroxisomes are tagged for degradation and subsequently removed by autophagy ("pexophagy") (Fig. 8) [reviewed in [84–86]]. We hypothesize that the glycosomes of Kinetoplastida serve a similar function: metabolic units that are easily and efficiently replaced by other units (glycosomes with a modified enzymic content) when different environmental conditions are encountered, or when the cells differentiate to prepare for a change (e.g. transition of replicating long-slender T. brucei to non-replicative, short-stumpy cells, prepared for transmission to the tsetse fly intestine). Research to test this hypothesis is in progress (M. Herman and PM). The notion that glycosomes/peroxisomes provide metabolic flexibility necessary for adaptation to changing growth conditions should possibly hold true to many more organisms. For example, E. gracilis can gow under both phototrophic and heterotrophic conditions. Cells grown in the dark on acetate have peroxisomes containing active enzymes of the glyoxylate cycle, whereas its enzymes of the glycolate pathway have low activity. When these cells become green upon exposure to light, the activity of the former enzymes and catalase increase only slightly, while the glycolate pathway enzymes, necessary for photorespiration, show a large increase in activity . As mentioned already above, different Kinetoplastida dwell in highly different environments, and also the conditions encountered by kinetoplastid species at different stages of their life cycles may differ dramatically. These environmental variations also involve the energy and carbohydrate sources and the oxygen supply. Mammalian-infective T. brucei and plant-infective Phytomonas, living in sugar-rich environments (blood and plant tissues such as phloem, latex and fruits) have an essentially fermentative metabolism, with a major involvement of the glycosomes. Nevertheless, the mitochondrion plays an important role in the energy metabolism of all Kinetoplastida studied, even in these largely glycolytic life-cycle stages where many functions of the organelle are repressed. This largely repressed mitochondrion has a simple morphology (hardly any cristae), lacks most Krebs' cycle enzymes and is incapable of oxidative phosphorylation. Although these essentially glycolysis-dependent forms of T. brucei and Phytomonas do not express a cytochrome-containing respiratory chain, they both have an active GPO associated with the inner mitochondrial membrane. As mentioned above, the function of the GPO is to oxidize the excess of reducing power generated by glycolysis. By RNAi it was shown for bloodstream-form T. brucei that the plant-like AOX of the GPO is very important, if not essential . Furthermore, in bloodstream-form T. brucei, an electrical membrane potential could be measured across the membrane, which is not produced by the GPO activity but by the F0F1-ATPase that is present . Some genes of the mitochondrial DNA are transcribed and their RNA edited. Also an active complex I (NADH:ubiquinone oxidoreductase) of the respiratory chain has been described for these T. brucei cells, and has been suggested to transfer electrons via ubiquinone to the AOX . Indeed, it has been shown for several mitochondrial genes and for some components of the RNA editing machinery that they are also vital for long-slender bloodstream-form T. brucei . The other kinetoplastids analyzed so far have a well-developed mitochondrion sometimes with most Krebs' cycle enzymes and often even with all enzymes of the cycle. A functional cytochrome-containing respiratory chain capable of energy-transduction is present, although the occurrence of a functional complex I is a matter of debate. A functional AOX is also present in procyclic T. brucei, but its presence in Leishmania pro- and amastigotes has been questioned . In addition to the Krebs' cycle enzymes, the mitochondrial matrix appears to possess an acetate:succinate CoA transferase cycle that is also involved in ATP generation (Fig. 2B) . The insect-stage trypanosome can use both glycolytic substrates and amino acids as carbon and energy sources. Amino acids, notably proline, are the predominant carbon sources in the insect midgut and hemolymph. As a consequence, proline is the most important nutrient for several insect-stage kinetoplastids . It enters the mitochondrion where it is converted to glutamate and, after transamination to α-ketoglutarate becomes available as substrate for the Krebs' cycle enzyme α-ketoglutarate dehydrogenase (Fig. 2B). However, sugars are alternative substrates (obtained for example via plant saps or blood meals). The pyruvate resulting from glycolysis enters the mitochondrion and, via the pyruvate dehydrogenase complex, is converted to acetyl-CoA. However, proline is not necessarily the preferred carbon source used by culture-adapted procyclic T. brucei ; a rate of proline consumption approximately 3-4 times lower than glucose or threonine has been measured (; FB, unpublished). Furthermore, it was reported that the relative rates of glucose and proline consumption may be highly dependent on the nature of the growth-limiting nutrient and the growth rate . Whether sugars or amino acids are the carbon/energy source in trypanosomatids and are metabolized by the mitochondrion, it is remarkable that none of them is completely degraded to CO2, but instead, to succinate, acetate, lactate and alanine (when glucose is used as a substrate) or succinate (with proline – as observed in experiments with procyclic T. brucei). Recently, it was shown that the full Krebs' cycle is not used by procyclic T. brucei that have been provided with either glucose or proline, although all enzymes are present . Indeed, when incubated in the presence of [C6-14C]-D-glucose, none of the produced CO2 is radiolabelled, confirming that the acetyl-CoA resulting from glycolysis is not metabolized through the Krebs' cycle (; FB, unpublished). Consequently, acetyl-CoA produced in the mitochondrion by the pyruvate dehydrogenase complex must have been converted into the secreted end product acetate via the acetate:succinate CoA transferase cycle. The ATP production in this cycle occurs by an enzyme shared with the Krebs' cycle, succinyl-CoA synthase. Furthermore, proline is also only partially metabolized to succinate, supposedly via α-ketoglutarate and succinyl-CoA by succinyl-CoA synthase (Fig. 2B) . Interestingly, it was shown by RNAi that succinyl-CoA synthase is essential for growth of procyclic T. brucei in a medium containing both glucose and proline, indicating that mitochondrial substrate-level phosphorylation is essential for ATP production in the parasite . However, respiratory-chain activity is essential for growth and survival. It is important for the oxidation of excess reducing power (NADH) and possibly also for the generation of a transmembrane proton gradient necessary for additional ATP production (oxidative phosphorylation), for solute transport and for protein import involved in the organelle's maintenance and biogenesis. It has been proposed that the presence of an AOX in procyclic T. brucei, in addition to the cytochrome c oxidase, is also important for removing excess reducing equivalents and so preventing the production of reactive oxygen species . This is similar to one of the functions attributed to the AOX in plant mitochondria . One may, therefore conclude, that in procyclic trypanosomes metabolism is also essentially fermentative, despite the presence of a full enzymatic machinery for oxidative metabolism. No exogenous electron acceptors other than oxygen are known to function with trypanosomatid mitochondria, in line with the observation that these organisms stop growing under anaerobiosis. Some trypanosomatids may survive during periods under anaerobic conditions, but this could not be attributed to anaerobic respiration. In bloodstream-form T. brucei, under anaerobic conditions, glycerol 3-phosphate accumulates in the glycosome and the glycosomal ATP/ADP ratio drops. This leads then to conversion of glycerol 3-phosphate into glycerol with concomitant synthesis of ATP via the reverse action of the glycosomal glycerol kinase (Fig. 2A). By this process, one molecule each of pyruvate and glycerol are produced per molecule of glucose, instead of two molecules of pyruvate, and the net production of ATP is decreased from two molecules to one. Indeed, the cellular ATP levels drop significantly . The cells remain viable for some hours, but the decreased ATP production seems not to be sufficient to sustain growth for longer periods. Under anaerobiosis for 24 h, or when the AOX activity is significantly decreased by the inhibitor salicylhydroxamic acid or RNAi, cells will eventually die . For L. infantum promastigotes, it has also been shown that they, to a certain extent, could survive periods without respiration . These cells showed a reduced glucose degradation, sluggish motility and inhibition of proliferation. Prolonged anaerobiosis resulted in metabolic arrest, which was shown to be reversible for up to 48 h upon restoration of oxygen supply, but for longer periods (after > 100 h) was followed by death. How these cells survive for some period in the absence of oxygen remains to be determined; no electron acceptors other than oxygen could be identified for the respiratory chain. It is also feasible that in procyclic T. brucei (as well as T. rhodesiense, T. gambiense, T. equiperdum and T. evansi) anaerobiosis can be temporarily overcome via glycerol production. However, other Trypanosoma species (T. vivax and T. congolense), Phytomonas and Leishmania have a limited capacity to produce glycerol . This has been attributed to specific features of the active-site structure of the glycosomal glycerol kinase, affecting the substrate affinity of the enzyme . It should be stressed again that most knowledge about trypanosomatid metabolism has been obtained for two life-cycle stages of T. brucei: the bloodstream and the procyclic forms. As we discussed already, the bloodstream-form is highly peculiar, and many of its features are possibly only representative, to some extent, for Phytomonas, but not for other kinetoplastids, not even for the mammalian-infective stages of other trypanosomatids such T. cruzi and various Leishmania species. One may wonder to what extent the T. brucei procyclic form is representative of other metabolic stages and of other kinetoplasts. As for T. brucei, it has been found for all of the other kinetoplastids studied so far (T. cruzi epimastigotes, trypomastigotes, amastigote-like forms; promastigotes or amastigotes of various Leishmania species, Crithidia fasciculata or C. luciliae choanomastigotes) that glucose or amino acids are not, or not fully, converted to CO2, but to organic acids or other typical fermentation products (succinate, acetate, lactate, pyruvate, alanine, ethanol, glycerol), despite the presence of a functional respiratory chain in all these forms [reviewed in [34, 35, 104]]. In Phytomonas also, with its mitochondrion in which cytochromes and most Krebs' cycle enzymes could not be detected [105, 106], similar end products of glucose metabolism were found (acetate, ethanol, CO2, glycerol and small amounts of various organic acids) . These data indicate that all kinetoplastids studied have an essentially aerobic fermentation, not involving a full Krebs' cycle activity. The respiratory chain is, in most cases, functional and may serve to oxidize the excess of reducing power and to produce ATP by oxidative phosphorylation; but this remains to be established for most kinetoplastids. Phytomonas is a peculiar case by lacking a classical respiratory chain. The excess of reducing equivalents generated during glycolysis in its glycosomes may be shuttled to the mitochondrial GPO by the involvement of glycosomal and mitochondrial MDHs . Furthermore, part of the glycolytically produced pyruvate seems to enter the mitochondrion, to be converted into acetate via the pyruvate dehydrogenase complex and acetate:succinate CoA transferase . The NADH produced in this process may transfer its electrons via a NADH dehydrogenase complex I and ubiquinone to AOX; a functional complex I is possibly present . Several other dehydrogenases (e.g. MDH and a low-substrate specificity alcohol dehydrogenase with high affinity for iso-propanol) have been detected in the Phytomonas mitochondrion, but their precise function in energy metabolism remains to be established [108, 109]. Despite all these examples suggesting that a functional full Krebs' cycle activity is not used, even if all enzymes are present, and the seemingly partial use of the capacities for respiration and oxidative phosphorylation, full use of metabolic potential cannot be excluded for the various other life-cycle stages of the highly limited sample of trypanosomatids studied, or for other kinetoplastids. Even two trypanosomatids with seemingly very similar metabolic patterns, such as cultured insect stages of L. donovani and T. brucei, showed important differences when subjected to a comparative physiological analysis by using a chemostat [96, 110, 111]. These parasites employ widely different strategies when dealing with changing environmental conditions. L. donovani aims at strictly maintaining internal homeostasis, while T. brucei displays a rather opportunistic style by adjusting its metabolic processes to get maximum energy efficiency. These differences may well reflect the diets of their respective hosts. Leishmania spp. reside in the sand fly that feeds on plant juices as well as blood, while the tsetse fly, host of T. brucei, restricts itself to blood meals only. How should the evolutionary development of the metabolic particularities of the kinetoplastid mitochondrion be explained? Of course, other even more distinct features of the mitochondria of these organisms have repeatedly raised the question as to the evolutionary history of the organelle. These features include the kinetoplast DNA with its highly unusual structure and replication mechanism , the organization and structure of the genes encoded by this DNA and the unique and extensive editing of its precursor RNAs to functional mRNAs [16, 113, 114]. Despite these unusual aspects (outside the scope of this review and not discussed further here), the generally accepted notion is that the mitochondrion arose in a common ancestor of all extant eukaryotes, including the Kinetoplastida [115, 116]. Phylogenetic studies point towards a monophyletic origin of the organelles from an endosymbiont related to present-day α-proteobacteria. Several data suggest that this endosymbiont has given rise not only to the large diversity of mitochondrion-related organelles comprising both aerobically and anaerobically functioning mitochondria, characterized by the presence of different sets of enzymes and different electron donors and acceptors for their respiratory chains, in addition to the 'classical' mitochondrial systems, but also to hydrogenosomes, hydrogen-producing organelles found phylogenetically dispersed in anaerobically living organisms [115, 117, 118]. To explain this common origin, it is supposed that the ancestral endosymbiont was a facultative anaerobic bacterium that possessed the majority of the aerobic and anaerobic systems found in mitochondria of different taxons of present-day organisms. These systems comprise: the Krebs' cycle, a respiratory chain with several terminal oxidases for oxygen and other electron acceptors and with quinones of corresponding redox potential (ubiquinone for oxygen and nitrate, menaquinone for fumarate), hydrogenase, both a pyruvate dehydrogenase complex and a pyruvate:ferredoxin oxidoreductase, and an acetate:succinate CoA transferase (Fig. 9). Possible scenario of the evolution of the mitochondrion in Kinetoplastida. A facultative anaerobic, 'pluripotent' ancestral eukaryote was formed by endosymbiosis of a facultative anaerobic α-proteobacterium by an archaebacterial host. It has been proposed  that different capacities of the original symbiont were lost in different eukaryotic lineages, leading to different types of organelles (aerobic mitochondria, anaerobic mitochondria, hydrogenosomes). In Kinetoplastida, the original hydrogenase, anaerobic terminal oxidases and the capacity to synthesize quinones of low redox potential were lost. Indications for the retainment of the PFO have been reported, but its presence still requires unequivocal confirmation. 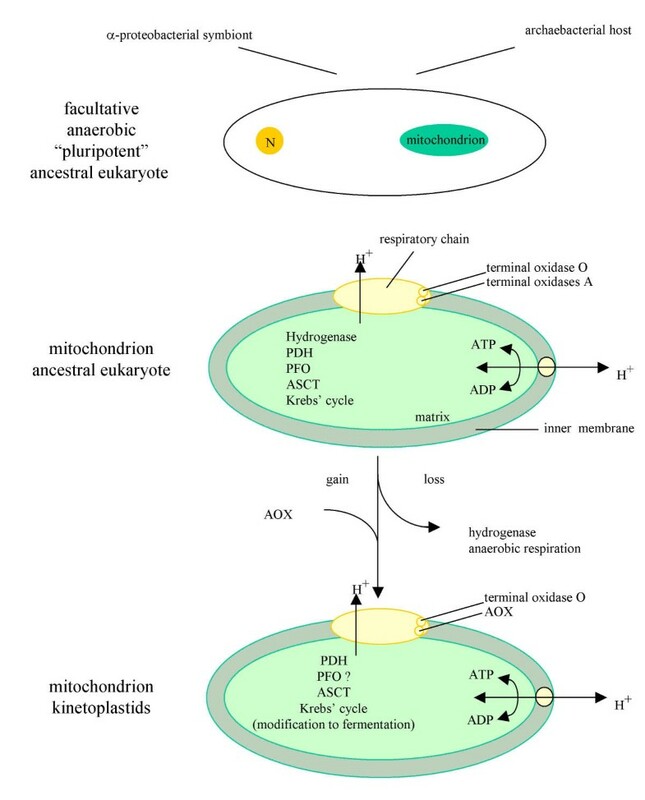 The kinetoplastid mitochondrion acquired an AOX and its metabolism became partially fermentative (see text). Abbreviations: AOX, alternative oxidase; ASCT, acetate:succinate CoA transferase; PDH, pyruvate dehydrogenase complex; PFO, pyruvate:ferredoxin oxidoreductase; terminal oxidase O, O2-dependent terminal oxidase; terminal oxidases A, terminal oxidases using 'anaerobic' electron acceptors. It has been proposed that in aerobic environments the anaerobic capacities of the original endosymbiont were lost or modified, whereas in lineages of organisms living anaerobically the aerobic capacities were lost. In addition, the organelles could be further modified by the acquisition of new enzyme systems via lateral gene transfer. For the Kinetoplastida, it was then inferred that, during evolutionary history, hydrogenase was lost (Fig. 9). Similarly, respiratory-chain oxidases relying on non-oxygen acceptors and the capacity to synthesize quinones of low redox potential were lost, at least in those organisms studied (T. brucei, Leishmania), and mitochondrial metabolism became largely fermentative (incomplete oxidation of carbon sources to succinate and acetate). The retainment of not only the pyruvate dehydrogenase complex, but surprisingly also the O2-sensitive pyruvate:ferredoxin oxidoreductase is suggested by the finding that T. brucei contains a DNA sequence encoding a homologue of this enzyme , and reports of pyruvate:ferredoxin oxidoreductase activity in procyclic forms of both T. brucei  and T. congolense . One major acquisition was the AOX (Fig. 9), possibly from the algal-like endosymbiont that is also assumed to have contributed substantially to the glycosomal enzyme systems. Based on the information provided above about the evolutionary tracks of energy metabolism in Kinetoplastida, and the hypotheses put forward, some inferences may be made about the metabolism of the common ancestor of all Kinetoplastida. The ancestor, before the divergence of Kinetoplastida and Euglenida, must have possessed a mitochondrion, peroxisomes and, very probably, a phototrophic green alga-like endosymbiont. The presence of this symbiont implies that the organism was free-living in surface layers of water where photosynthesis was possible. This was, most likely, a (facultatively) aerobic environment. Moreover, by photosynthesis, the organism was able to produce oxygen itself. The presence of peroxisomes would have protected the organism against reactive oxygen species, whereas the mitochondrion will have enabled the cells to produce sufficient ATP. The glycolytic, gluconeogenic and pentosephosphate pathways of this organism are supposed to have been present in the cytoplasm, and were only later (partially) compartmentalized, i.e. early in the kinetoplastid lineage, when the glycosome was created by a kind of merger between the algal endosymbiont and a peroxisome [22, 122]. In different Trypanosomatidae (T. brucei, T. cruzi and Leishmania species) as well as in Apicomplexa (Plasmodium, Toxoplasma) acidic Ca2+ storage organelles have been found which have been called acidocalcisomes [reviewed in ]. Further research showed that acidocalcisomes are storage organelles not only for Ca2+, but also contain a high content of inorganic pyrophosphate (PPi), polyphosphate, Mg2+, Na+ and Zn2+. The membrane of these organelles contains various proton-ion exchangers and proton- and Ca2+-pumping ATPases, responsible for the acidification and ion accumulation. An important enzyme of the organelle is the proton-translocating pyrophosphatase (H+-PPase), related to the V-H+-PPase found in vacuoles of plants and algae and in chromatophores of some photosynthetic bacteria. Interestingly, it was recently shown that electron-dense vacuoles, already identified a long time ago in the green alga Chlamydomonas reinhardtii, are very similar to the acidocalcisomes . These vacuoles have a matrix that is similarly acidic and has a comparable chemical composition. Moreover, similar proton pumps were identified. In view of the strong indications for a green-algal endosymbiont in ancestral organisms of both Apicomplexa and Kinetoplastida, it seems possible that these unrelated groups of protists also acquired the acidocalcisomes by this route. However, further support for this notion would require more studies on the distribution of these organelles among protists and on their relationship with acidic polyphosphate-containing granules in other microorganisms and plants. Indeed, acidocalcisomes have recently also been described in the slime mold Dictyostelium discoideum . The acidocalcisomes seem to play a role in trypanosomatid energy metabolism. Through their ion and proton pumps, these organelles may be involved in the regulation of the intracellular pH and osmolarity, and it has been proposed that the PPi accumulated in these organelles act as energy store. This would be complementary to the use of the polysaccharide mannan, which was identified as a carbohydrate and energy store in several trypanosomatids . In bloodstream-form T. brucei, no accumulation of either PPi or mannan has ever been observed. Nevertheless, acidocalcisomes are also important for these cells; depletion of the V-H+-PPase by RNAi led to reduced growth of both bloodstream-form and procyclic T. brucei, loss of acidity of acidocalcisomes, and reduction of their polyphosphate content . Furthermore, it was shown for procyclic cells that the ability for pH homeostasis was severely affected. Because of the presence of acidocalcisomes in trypanosomatids, and the important role of PPi in the function of these organelles, one may wonder if this high-energy compound exerts additional important roles in the energy metabolism of these organisms, or has done so in earlier stages of their evolution. Indeed, the PPDK mentioned above is an enzyme discovered in glycosomes of various trypanosomatids (although not expressed in bloodstream-stage T. brucei) that reversibly converts PEP into pyruvate with the concomitant synthesis of ATP from AMP plus PPi . Intriguingly, the glycosomal PFKs of all Kinetoplastida have a strictly ATP-dependent activity but the sequences analyzed (T. brucei, L. donovani, T. borreli) are more similar to PPi-dependent PFKs than to their ATP-dependent counterparts [49, 127]. This suggests that the enzyme has been derived from a PPi-dependent ancestral PFK, which changed its phospho-donor specificity during evolution. In nature, glycolysis can be linked to either PPi or ATP. If the PPi, produced as a side product of biosynthetic processes, is not hydrolyzed by pyrophosphatase, but its high energy is invested in glycolysis by the action of PPi-PFK and/or PPDK, instead of using ATP, theoretically the net ATP yield of glycolysis increases from two to maximally five molecules per molecule of glucose consumed. This variation involving PPi has been found in many obligate or facultative anaerobic protists and bacteria, organisms which often live under energy-limiting conditions [128, 129]. If indeed a change from PPi – to ATP-dependent glycolysis has occurred in some ancestral organisms, it would suggest that energy limitation was no issue for these organisms. During evolution, the process might have changed its specificity: this would have involved an alteration of the PFK active site to modify the phospho-substrate specificity and the replacement of PPDK by PYK. As was shown by site-directed mutagenesis, changing the preference of a PFK from PPi to ATP is feasible, suggesting the presence of a latent binding site for the larger nucleotide substrate . When did the kinetoplastid PFK obtain its specificity for ATP as phospho donor? Did the specificity change during the evolution of the lineage or in an earlier ancestor, before the Kinetoplastida or Euglenozoa branches occurred? Or has the ATP-dependent PPi-like enzyme been acquired by lateral gene transfer? Possible answers to these questions were provided both by a phylogenetic analysis and by analysis of sequence motifs that can be correlated with known functions. The kinetoplastid PFKs appeared to be most related to a class of PFK isoenzymes found in the anaerobic protist Entamoeba histolytica and the Spirochaetes Borrelia burgdorferi and Treponema pallidum [49, 131, 132]. Two Arabidopsis thaliana sequences also cluster in this group . All these sequences resemble PPi-PFKs, but it has been shown that the activity of this minor PFK isoenzyme of Entamoeba is ATP-dependent , like that of the kinetoplastid PFKs. The major PFK of E. histolytica is an authentic PPi-PFK and is more distantly related. The phospho-donor specificity of the Spirochaetes and Arabidopsis isoenzymes remains to be determined. However, it is very likely that they are also ATP dependent, because they contain the active-site glycine that is suggestive of nucleotide binding, rather than the aspartic acid residue correlated with PPi dependence . We assume, therefore, that the change of phospho-donor specificity occurred not within the kinetoplastid lineage. The ATP-dependent, PPi-like PFK was either already present in primitive eukaryotes and passed on to the kinetoplastid lineage, or it entered the kinetoplastids by lateral gene transfer. In case of the latter possibility, it could have happened via the algal endosymbiont, or by a different event, for example by lateral transfer from a Spirochaete (see also below). PPi-PFKs are common in plants and algae. They contain different PFK isoenzymes with activities dependent on either ATP or PPi . Searching the Arabidopsis genome database revealed several other genes coding for PPi-PFK-like proteins, some also having the active-site motif indicative of ATP binding, while others have probably remained PPi dependent. So far, however, no Euglena sequence similar to that of kinetoplastid PFKs has been identified that could reveal more clues about the origin of the kinetoplastid enzyme. The fact that a PPDK is present inside the glycosomes may be explained by the presence of PPi producing segments of various biosynthetic processes inside the organelle: fatty-acid oxidation, and pyrimidine and purine biosynthesis [8, 63]. Indeed, no pyrophosphatase activity could be detected within the organelle , so that PPDK seems to fulfil the task of PPi hydrolysis. Whether the PPDK was originally present in the ancestral organism, or if it was acquired with the phototrophic endosymbiont and retained in the glycosome is not clear. Interestingly, for another kinetoplastid glycolytic enzyme, the glycosomal GAPDH, a close phylogenetic relationship with its counterpart of Spirochaetes was also recently shown [134, 135]. A very similar GAPDH isoenzyme present in the cytosol of Euglena [11, 136] formed part of the same monophyletic cluster. The conclusion based on the phylogenetic analysis was reinforced by the presence of similar insertions and specific residues in these GAPDHs which may participate in endowing their active-sites with specific structural and functional properties . 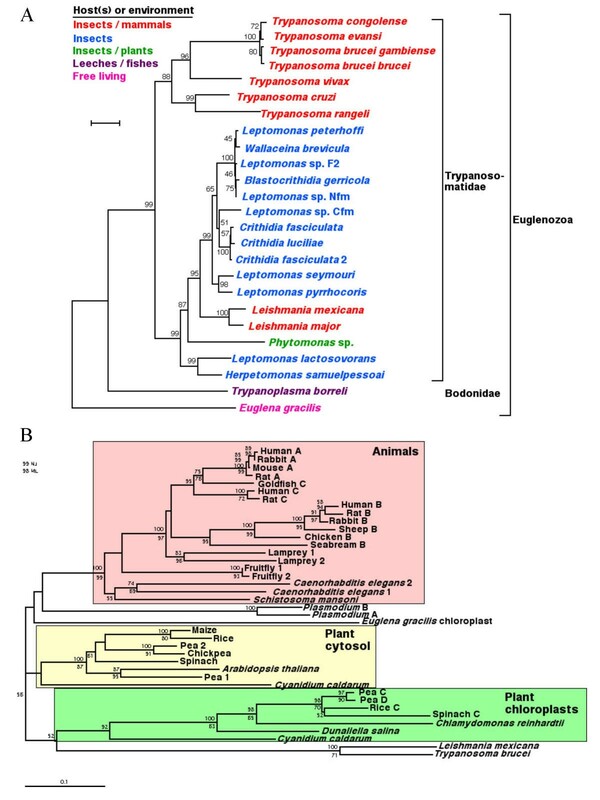 Furthermore, trypanosomatid enolases appeared most related to the corresponding enzyme from Entamoeba, but not to the enolases from Euglena, which in turn were more similar to the homologue from the spirochaete Treponema pallidum than they were to homologues from any of many other organisms sampled [42, 137]. These findings may suggest that lateral transfer of various housekeeping genes may have occurred from an ancestral spirochaete to the common ancestor of the Euglenida and Kinetoplastida, as well as to the ancestor of Entamoeba. The different lineages each retained a different set of transferred genes. More studies will be necessary to provide further support for this hypothesis. There are strong indications that another glycolytic enzyme also entered the trypanosomatid lineage by lateral gene transfer: the cytosolic isoenzyme of GAPDH. All members of the Trypanosomatidae studied so far have two GAPDH isoenzymes, one in the cytosol and the other one -the Spirochaete-related enzyme- in the glycosomes. These two enzymes differ considerably in amino-acid sequences (about 55% identity) and kinetic properties [138–140]. In the bodonid T. borreli only a single GAPDH, related to the glycosomal isoenzymes of the Trypanosomatidae and the cytosolic one of E. gracilis, could be detected , although GAPDH activity was measured in both compartments. These data suggest that initially the Kinetoplastida contained only a single GAPDH present in both compartments. In an ancestral trypanosomatid, after the divergence from the bodonids, an additional GAPDH was acquired, most likely by lateral gene transfer from a γ-proteobacterium [134, 135]. The newly obtained enzyme established itself in these organisms to fulfil the cytosolic GAPDH functions, whereas the original GAPDH became fully compartmentalized inside the glycosomes. The glycosomal enzyme is directly involved in the glycolytic flux going through the glycosomes , whereas the function of the cytosolic isoenzyme has still to be identified. This is currently being addressed in T. brucei cells in which the expression of the enzyme is decreased by RNAi (VH, unpublished). Whereas many kinetoplastids parasitize only a single host (so called 'monogenetic' parasites), others have two hosts ('digenetic' parasitism): an invertebrate (arthropod or leech) and a vertebrate. The invertebrates transmit the parasites between the vertebrate hosts. As long as a century ago, two opposing theories were proposed about the question of which host was the original one. One theory states that parasitism started with monogenetic kinetoplastids of non-bloodsucking insects, which then became parasites of haematophagous insects and subsequently also of vertebrates ('invertebrate first') [143, 144]. The other hypothesis ('vertebrate first') has it that kinetoplastids initially established themselves as parasites in the alimentary tract of vertebrates -while transmitted as cysts-, then invaded the blood and were subsequently transmitted by blood-sucking invertebrates. According to this second theory, the monogenetic insect-dwelling kinetoplastids evolved from the digenetic ones [145, 146]. Arguments in this discussion were originally based on parasitological data only, but new insights into phylogenetic relationships based on sequence data have, in recent years, contributed to it [3, 15, 17]. This new combination of parasitological and phylogenetic data has not yet solved the issue; support for both hypotheses has been inferred from the available data. Moreover, these analyses have led to proposals that the transition to parasitic life style occurred multiple times in kinetoplastids and that the process may still occur now and in the future. A comprehensive discussion of the origin and evolution of parasitism in Kinetoplastida is outside the scope of this review, and the reader is referred to the references given. We will address the issue here briefly from a metabolic perspective. Although knowledge about the metabolism of kinetoplastids is unlikely to provide a definite solution to the 'invertebrate first versus vertebrate first' issue, it may provide additional arguments to the discussion. It may be important to appreciate, in this respect, that in both theories the invasion of parasites into the blood circulation system, although via different scenarios, plays a prominent role. It seems relevant to note that parasites living in a stable environment, with plentiful carbon sources as energy supply and materials for biosynthetic processes have a highly reduced metabolism. This is clearly illustrated both by the bloodstream-form of African trypanosomes and by Phytomonas species living in plants. In most representatives of the former group, a majority of the available genetic information for metabolic catabolic and anabolic systems (of glycosomes, mitochondrion and cytosol) is repressed in the mammalian-infective stage; it is only expressed in the insect-stage trypanosomes which have a much more elaborate metabolism. In two species, T. evansi and T. equiperdum, which cannot complete cyclical transmission in the tsetse fly but instead are mechanically transmitted, mitochondrial gene expression is even disrupted by massive deletions and rearrangements [147, 148]. Similarly, mitochondrial activity in Phytomonas serpens was shown to be severely affected by loss of genes . Another striking example is the inability of bloodstream-form T. brucei to maintain a neutral pHin under acidic conditions [149–151]. The cell relies on the constant blood pH of the host and seems to have repressed part of its system for pHin homeostasis. In contrast, procyclic trypanosomes and other trypanosomatids employ an active H+-ATPase for pHin homeostasis over a wide range of pHout values . These data suggest that parasites will readily repress their metabolic capacity when living in a plentiful and stable environment such as blood and plant saps or fruits, and may even dispense with an important part of the DNA coding for functions not necessary for life in this environment, unless they will need the encoded proteins during other stages of their life cycle. This seems to provide some support for the 'invertebrate first' hypothesis. The alternative is rendered less likely by the fact that the bloodstream parasite may have lost genes essential for a potential life under the more demanding conditions of the insect alimentary tract, but redundant for its stay in the mammalian bloodstream, well before the blood-sucking insect became available for transmission of the parasite between mammals. Research in recent years has shown that the eukaryotic cell is a chimera. Different parts of its protein content and different organelles can be traced to different origins. This chimeric origin seems particularly true for the unicellular Protista, where lateral transfer of genes, from prokaryotes or other protists must have occurred frequently during evolutionary history. As we discussed in this review, such gene transfers have possibly also been important in shaping the kinetoplastid cell, and even involved the core energy- and carbohydrate metabolism. Biochemical and molecular biological research on different Kinetoplastida and information that became available through genome sequencing projects have recently provided the possibility to reflect, on a more solid basis than before, upon the evolution of energy and carbohydrate metabolism in these protists. The common ancestor of the Kinetoplastida and Euglenida must have been a free-living organism, because all estimates indicate that it must have existed in a period of the earth's history when multicellular organisms did not exist yet. It already contained peroxisomes and a mitochondrion, and may thus have lived either aerobically or anaerobically. In addition to the lateral transfer of genes associated with the acquisition of the endosymbiont that developed into the mitochondrion, influxes of genes for metabolic enzymes from other organisms may have also occurred. In addition, the kinetoplastid lineage seems to have acquired a green alga as an endosymbiont and could live phototrophically; this alga was reduced to a chloroplast in the Euglenida. In Kinetoplastida, the selective advantage to exploit light as energy source was apparently less strong than that for living merely heterotrophically on organic carbon sources such as sugars. Consequently, the alga was lost, but only after it had transferred many of its genes to the host nucleus. Also present-day euglenid species are known which have lost the capacity for photosynthesis and can only grow heterotrophically [153, 154]. They may still retain the organelle, but with a highly reduced plastid genome; this was shown, for example, for Astasia longa . The loss of the endosymbiont from the ancestral kinetoplastid may have happened via a transitory stage that involved fusion with host cell compartments. Proteins encoded in the nucleus, either from the original host or endosymbiont, were provided with signals to route them to appropriate cell compartments. In this way, many enzymes involved in energy/carbohydrate metabolism ended up in the peroxisomes which consequently became glycosomes. Maybe acidocalcisomes were also acquired in this period. Representatives of the kinetoplastids spread over a variety of different environments and, in due time, many of them became parasites of insects, leeches, representatives of all major vertebrate lineages and even plants. The transition to parasitism may have allowed the loss of metabolic capabilities when the kinetoplastid could rely for them on the host organism, for example for constant environmental conditions with regard to carbohydrate and energy sources, pH and oxygen, or for the availability of building blocks for various biosynthetic processes, as found in blood circulation systems. On the other hand, when the parasite lived in a host compartment where conditions may have regularly changed, such as in an alimentary tract, it was imperative to retain a large metabolic capacity. Where kinetoplastids evolved to digenetic parasites, involving two different hosts and often even different host tissues, they had to find means for efficient adaptation of their metabolism to the -sometimes highly- different environments encountered. This implied the development of mechanisms to regulate differentially the expression of their metabolism in different life-cycle stages. Metabolic flexibility must have been a highly selective advantage during the different stages of this evolutionary scenario; possibly, the availability of core metabolism compartmentalized within glycosomes has been instrumental in this respect. The present-day kinetoplastids comprise a large variety of protist organisms which share some morphological and molecular features derived from a common ancestor, but yet may be quite different because they have evolved along separate tracks for a long time, in some cases for hundreds of millions of years, and dwell in highly different environments. In this review, we have tried to trace parts of the tracks by which energy metabolism in these organisms evolved. We have based our evolutionary reconstruction largely on new data obtained by recent biochemical analysis and genome sequencing projects. However, the available data are highly biased with almost all analyses done on only a few parasitic trypanosomatids, particularly T. brucei. For a better understanding of the evolution of energy metabolism of Kinetoplastida it will be necessary to continue analyzing the data obtained by the genome sequencing projects of T. brucei, L. major and T. cruzi, which will reach completion in the near future, and by the subsequent functional large-scale projects on these organisms (transcriptome, proteome, metabolome). Biochemical, cellular and molecular biological analysis of a larger sample of kinetoplastids (e.g. Phytomonas, parasitic and free-living Bodonina) and comparison with data from other protists (among others Euglena) will be important to better understand how and why the peculiarities of kinetoplastids evolved and why many of these organisms have become such successful parasites. This knowledge may also help to develop compounds to efficiently combat the various serious diseases of mankind, livestock and crops caused by kinetoplastid parasites. Ideas developed in this review are in part based on work performed in the laboratories of the authors that was made possible by financial support to PM and FO from the European Commission (INCO-DC and INCO-DEV programmes), the Belgian 'Fonds de la Recherche Scientifique Médicale' (FRSM) and Interuniversity Attraction Poles – Federal Office for Scientific, Technical and Cultural Affairs, and the Université Catholique de Louvain ('Action de Recherche Concerté'). FB has been supported by the 'Conseil Général d'Aquitaine' and the European Commission (INCO-DC and INCO-DEV programmes). We are grateful to the following persons for stimulating discussions and comments on preliminary versions of the manuscript: Drs Linda Fothergill-Gilmore (Edinburgh, UK), William Martin (Düsseldorf, Germany), Miklos Müller (NewYork, USA), Daniel Rigden (Brasilia, Brazil), Aloysius Tielens and Jaap van Hellemond (Utrecht, The Netherlands) and Antonio Uttaro (Rosario, Argentina). We thank Dr Mark Farmer (Athens, Georgia, USA) for providing relevant information on the biology of euglenids and Mrs Nathalie Chevalier (Brussels) for expert technical assistance in a considerable part of the research quoted in this paper and for the preparation of several figures.